10.30.11 In a race that came down to the final tournament Roger Morin outlasted Lance Beloungie to take first place in the 2011 Maine Chess Player of the Year Competition. Congratulations to both Morin and Beloungie and to all who participated in this year-long event. Here are the final standings and images of the winner and runner-up. 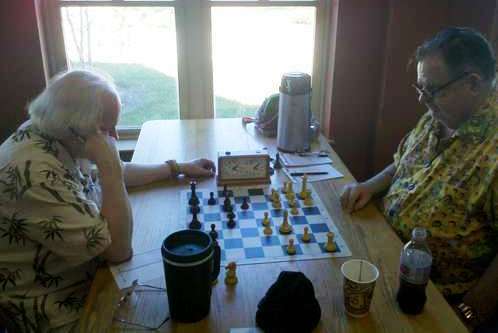 Roger Morin (right) and Lance Beloungie play head-to-head at the 2011 Eastern Maine Open at the University of Maine in Orono. Thanks to Lee Doucette for contributing to this report. The 2011 Maine Chess Player of the Year concluded with the Eastern Maine Open held October 1, 2011 at the University of Maine in Orono. This year's competition featured seven tournaments at locations from Presque Isle to Portland, and had thirty-three competitors. Going into the final tournament, Lance Beloungie of Caribou held first place over Roger Morin of Houlton by a mere 0.3 points. Although Beloungie finished with 1.5 score points and 4 game points, Roger put up 2.5 score points and 4 game points to provide the winning 0.7 point margin, giving Morin clear first place in the year-long competition. The Maine Chess Association congratulates both players for their fierce, year-long battle, and wishes to thank all this year's participants. A prize fund will be paid for first and second place winners, and Roger Morin's name will be added to the Maine Chess Player of the Year traveling trophy, which he will hold until next year's winner is determined. Next year's CPY competition format and schedule will be discussed and approved at the MECA Annual Membership to be held in Augusta beginning at 1:00 PM on Sunday, November 6, 2011. Location and agenda for the meeting will be available on ChessMaine.net shortly. All members are welcome and encouraged to attend if possible (and renew your memberships! ).